Spring has officially sprung, and I could not be happier. While I do love being cosy at home and wrapped in a blanket, I miss sunny days with long lazy walks followed by a fresh spring salad, ideally eaten outdoors. By the way, Tthe secret to making a pile of leaves and vegetables taste bomb? Smother it in a creamy-licious salad dressing. I’ve done it with a kale salad in the past which you guys loved, so I figured this time we’d go for something more spring-y. Tasty enough to enjoy as a main – just add some extra protein! Easy to make – under 15 minutes! I know some who are just not a fan of salads, but I do think you should give this one a try. You might surprise yourself! Simply whizz all the ingredients together in a lil' food processor or blender, or mash the avocado by hand and stir in the remaining ingredients. Set aside while you prepare the salad. Prepare the fresh peas by boiling in a pot of salted water for 5-8 minutes, and add the broccoli for the final 3 minutes. They're done when tender and bright green - drain and place into a large bowl with ice and water to stop the cooking. Remove and discard outer leaves of the butterhead lettuce. Chop remaining leaves into bite-size pieces, rinse and dry (I use a salad spinner). Set aside in a large bowl. Chop your beet in thin slices, with either a mandolin or a good knife - be careful with your fingers! Place in the bowl with the lettuce. Drain the peas and broccoli and add to the large bowl with the other salad ingredients and dressing. Toss together with the salad until every.single.leaf is coated in its glorious creaminess. Serves 4 as a side or 2 as a main - add some hummus and extra protein if serving as main (tofu, beans, salmon, etc). Hey Buddy!, I found this information for you: "Green Goddess Spring Salad – Healthy & Fresh!". 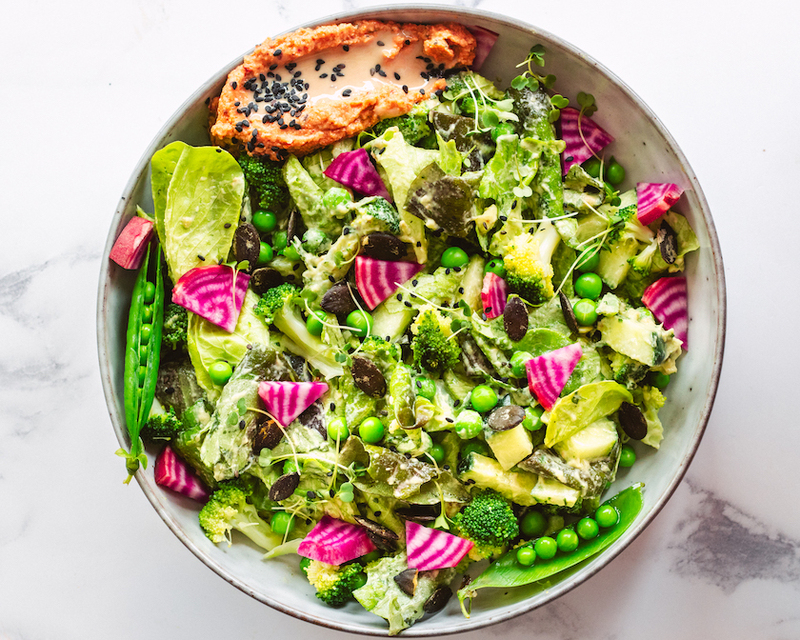 Here is the website link: https://www.sprinkleofgreen.com/green-goddess-spring-salad-healthy-fresh. Thank you.